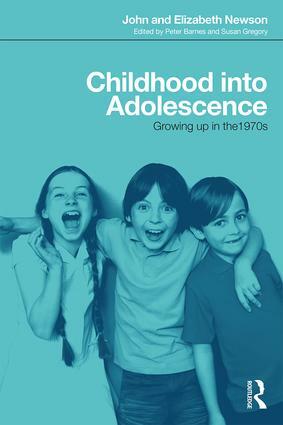 This book is about the lives of 11-year-old children growing up in a Midlands city in the late ‘60s and early ‘70s. Based on interviews with their parents, it describes family life at the time, as well as the experiences, hopes and concerns of the children as they themselves become adolescents. The book reflects upon the changes that occur for children in the transitional period between childhood and adolescence. It looks at the friendship patterns of eleven-year-olds, their special interests and activities and how they spend their leisure time as well as describing the children’s worries and concerns as perceived by their parents. It also considers family life and parental issues in the context of children’s growing independence and their developing sexual maturity. Originally written in the 1980’s but recently discovered and published now for the first time, this is the fifth book in the series of long-term investigations of child up-bringing, by John and Elizabeth Newson, distinguished child psychologists at the University of Nottingham. Their research began in the late 1950s when the cohort of children was a year old; their mothers were subsequently interviewed at intervals as the children grew up. This fifth volume draws links between the material from interviews with parents when their sons and daughters were seven, eleven, sixteen and nineteen years, and also invites comparison with the lives of children growing up now. The final chapter reviews the book series and the Newsons’ research programme. This exceptional book will be of interest to psychologists and other academics interested in child development, as well as professionals involved in work with children and adolescents such as teachers, doctors, nurses and social workers. It also has great historical significance with its potential for comparisons between the lives of children and adolescents now with those growing up some 50 years ago.